In today’s economic climate, a good job can be hard to come by. It can be even harder for those without the education or resources to land a job that provides a living wage. That’s where Work for Wisconsin, Inc., (WFW) comes in. The non-profit organization, which recently moved its offices to Riverwest from downtown, partners with businesses and educational institutions to help low-income people get and keep career-track, family-supporting jobs. 90 percent of those who benefit from WFW’s programs are inner city Milwaukee residents. The YMCA Community Development Corporation (CDC) — Riverwest also benefited from WFW’s move to the neighborhood, as WFW is sharing office space and rent costs with the CDC at 604 E. Center St. Executive director Dhul Waqar Yaqub is the sole employee at the new Riverwest office. 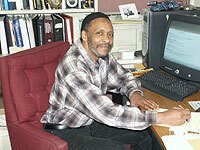 Yaqub has worked for WFW since 1995, when he moved to Milwaukee from Flint, Michigan. His background is in proprietary education, working with for-profit trade schools. Founded in 1979, WFW’s current focus is the Skilled Industrial Trades Recruitment and Retention (SITRR) program. The SITRR program provides training in welding, machining, construction, and Heating, Ventilation, Air Conditioning and Refrigeration (HVAC/R) installation and repair to qualified low-income job-seeking adults. The program also helps trainees find jobs and stay employed, offering continued guidance and “developmental education” to enhance critical thinking skills and self-directed behavioral change. When Yaqub began his work in Milwaukee, he found that a number of Milwaukee area public high schools had existing technical and trade resources that were either not in use or underused. To make better use of those resources, he works with individual schools and principals to negotiate training sites such as the welding shops at North Division and Pulaski High Schools, and the HVAC/R shop at Custer High School. He also works to secure grants to improve those facilities, as well as interacting with potential SITRR program candidates. The majority of people involved in the SITRR program are males between the ages of 27 and 50. Many are high school dropouts who work low-income jobs. WFW’s intent is for the SITRR program to create workforce development via the avenue of skilled trades; helping people without college educations find careers, not just jobs. “College is great, but we need to structure programs to accommodate people who are not college preparatory students,” says Yaqub.